I'm pleased to announce that with the patience of a saint, my husband helped me to create a new website. This one is specifically for the Nooks and Crannies series of paintings I've been working on recently. The web site includes a gallery of the paintings, as well as a revised artist statement, resume and bio. Thanks also to Alyson Stanfield, whose book I'd Rather Be in the Studio, as well as her newsletter helped me to face the onerous task of rewriting my Artist Statement! Here's one of the new ones. It's called Down the Drain. I challenge you to go to the Phoenix Art Museum and search the stalls in the ladies restrooms to find the exact location of this drain. 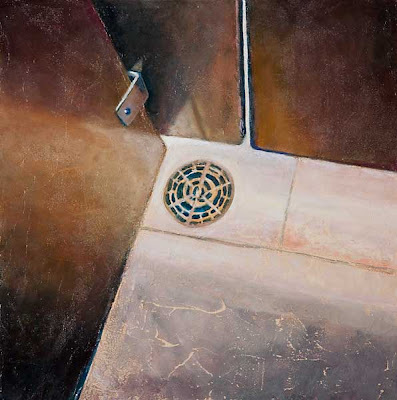 Yes, I admit that doing a painting of a drain in a bathroom is a bit unusual, but I was struck by the glow and sheen of the stalls in contrast to the slate floor. And the drain, the drain! I think it has a beautiful pattern.